Jim Clemens Collection No.3. 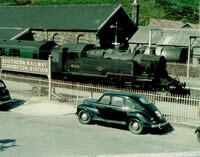 Jim visited North Devon and Cornwall often in the early 1960′s sometimes using the Atlantic Coast Express. This is a classic journey on the Atlantic Coast Express to the far flung reaches of the Southern Railway known as the Withered Arm, that part of the route west of Exeter. Join this celebrated train at Waterloo and travel via Basingstoke, Salisbury and Sidmouth Junction to EXETER CENTRAL seeing the line from the train and lineside in steam days, no single lines then. Onto the Withered Arm itself to BARNSTAPLE JUNCTION and ILFRACOMBE, virtually every station is seen. Return to BARNSTAPLE and travel south via INSTOW and BIDEFORD to TORRINGTON with 02 and Ivatt tank engines. Forward to busy HALWILL JUNCTION before an in depth visit to the BUDE branch and its harbour line. T9′s still visited here in 1961. Further west via LAUNCESTON to WADEBRIDGE, more classic steam with Beattie Well tanks, and T9′s to Padstow. BODMIN is visited, both General and North stations. Return via BERE ALSTON, GUNNISLAKE and OKEHAMPTON to EXETER Central. 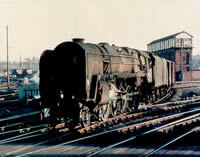 There is a visit to PENZANCE by a Bulleid Pacific, steam once again at BARNSTAPLE VICTORIA ROAD. This has to be the definitive video of the Southern in Devon and Cornwall superbly filmed in those sunny days of the early 1960′s all in colour. Again, the success of our Volumes 29 and 42 have led to this production centred on the Midland main line through Wellingborough and Kettering. However, views at Leicester, Nuneaton, Nottingham and Staveley set the scene to begin at Marylebone for the GC and St.Pancras to Luton. Remember when Class 27′s in their original livery worked suburban stock and the Wheathampstead to Dunstable branch was still with us? This time it is with diesel and early DMU as steam was covered in Volume 29. Next the steam scene north of Irchester Junction to Wellingborough and Kettering. In the early 1960′s freight dominated the railway here; 9F, WD and 8F engines pulled loaded and empty trains along the four track main line. Wellingborough shed and station saw Fowler and Jinty tanks and the 84000 Standard tanks on the locals to Northampton. 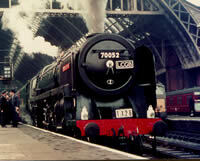 We traverse the route to Northampton Bridge Street with a 78000 Class mogul. The main traffic from the area was ironstone; visit Irchester, Finedon, Cranford and Kettering Furnaces industrial systems. There was a line to Butlins, Butlins Sidings that is! Engines working hard and fast, slow and branch line work, a feast of steam in an area now mostly devoid of the traffic you see in this video. The continuing story of the last eighteen months of Southern Steam. This volume covers the period January to March 1967. As in all volumes in this definitive series, the general Southern scene is portrayed between Waterloo and Weymouth. Although steam was in decline from the January timetable, we search it out throughout the region portraying any unusual events and give the reasons why. There were railtours over normally non-steam lines, the LCGB ran its 100th railtour during this period, much more successful than its 99th, seen in Part 5. The tour visited Chessington, Shepperton, Windsor and Reading Central Goods. The Surrey Downsman went to Oxted, Redhill and Kensington Olympia; it ended at a steamless London Bridge. We look at and examine Ron Cover’s attempts to dignify the steam engine with fabricated but brilliant numberplates. 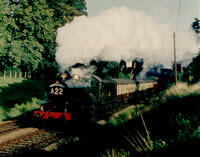 3442 “The Great Marquess” visited the region and we follow its run from Victoria to Brighton, Chichester and Southampton. The first electric trains ran on the Isle of Wight as the last O2′s were cut up at Newport. 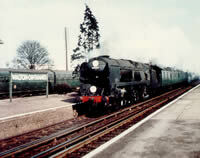 Another tour took a Bulleid pacific to Eastbourne. The story is told in the usual informative manner of this series after much research and knowledge from people who witnessed these events. Jim Clemens Collection No.2. Covers the steam scene around Shropshire. Beginning at Birmingham Snow Hill we travel via Wolverhampton and Oxley to Wellington Salop. Both routes into the town from Stafford and Crewe at all stations for most were in Shropshire. Shrewsbury in fine detail, Jubilee, Manor and Standard types. 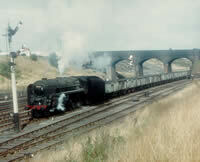 Leaton bank action in 1966, Gobowen to Oswestry. Whitchurch to Oswestry and Ellesmere to Wrexham. South of Oswestry to Llanymynech and Llanfylin. Nantmawr quarry to Gobowen with a steam hauled ballast train. Plenty of steam at Oswestry including the sight of a Castle on the shed in 1963. And we see the Shropshire & Montgomery on closure day in 1960 with the SLS tour. Absolute nostalgia. The demand for LMS steam scenes seems insatiable. Following on from our successful Lancashire & Yorkshire volumes we now look at the London & North Western lines. 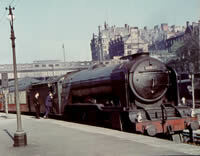 We will cover the West Coast Main Line and some of its branches and secondary routes from Euston to Glasgow. This first volume looks at the scenes of the 1960′s from Euston to Stafford via Northampton, Rugby and the West Midlands. With fifteen Duchess pacifics, four Princess Royals, Scots, Jubilees, Super D’s and Patriots, mixing it with Crabs, Jinties and Black 5′s, we have it all in this video. Visit Camden and Willesden Sheds, steam over Bushey troughs, steam and early electrics at Watford Junction plus five different Duchesses at Bletchley. More steam power at Roade and an in-depth look at Northampton with even a GWR interloper here!. The Highlight of the video has to be Rugby before and after the wires went up. Four Princess Royals pass the camera, Duchesses galore, Jubilee, Scot, Standards and even a 2P 4-4-0. There are sights of green liveried Class 40′s and a WD. Into the West Midlands with Super D and 8F at Saltley and Bescot. There is a Scot and a Duchess at Wolverhampton High Level; the trolleybuses were still here and an industrial Garratt works a colliery. This is how it was in the early 1960′s. Sheer magic. Jim Clemens Collection No.1. This is the first volume from the JIM CLEMENS COLLECTION covering the route of the famous CATHEDRALS EXPRESS from Paddington to Worcester and Hereford. Branch lines along the route are also visited such as Newbury to Didcot, Oxford to Fairford, Moreton to Shipston, Kingham to Notgrove and Chipping Norton. At Worcester we take a look at the “Vinegar” branch and the Kidderminster portion of the Cathedrals Express. On to Hereford with that portion viewing all stations and visiting the Bromyard branch, before Malvern and Ledbury and an arrival at Hereford. Castles abound of course with a little footplate running thrown in. There are Halls, Granges, Manor, 53xx, 28xx, 22xx, 4lxx and Panniers. A King appears at Princes Risborough and a GWR Railcar at Ledbury. This is pure detail on a route not seen on video before in its entirety. 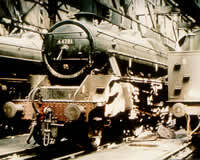 Part 2 begins with the work of shed pilot engines before assessing the needs of engine repairs at Works or in the sheds, boiler washouts, re-metalling axle boxes and other jobs for the fitters. The work of the breakdown trains were also the responsibility of the fitters; we visit loco derailments and see a WD 2-8-0 in steam and tenderless. The various types of turntables used for steam engines are now virtually extinct. Finally, the preparation of engines for the road from fire lighting to eventual ringing off the shed is seen in detail. An engine’s last run in steam and a driver’s last turn of duty on the footplate, are all carefully filmed and recorded by an army of enthusiasts to portray what really went on behind the scenes by those privileged to see it. A lasting memory to the footplatemen and fitters who had to do it. With the demise of steam on Britain’s railways the work of the engine sheds also disappeared. To keep a steam locomotive in traffic entailed much manual labour. Throughout our long association with enthusiast railway films we have amassed enough material to cover the subject in detail, albeit using some film already seen in some of our videos. By collating this film with new material obtained, we have put together the most comprehensive documentary on this subject ever. This video contains pure archive film on locomotive depots. There are no scenes of the shed’s locomotives out on the main line. This is how it really was for the many thousands of men involved in the maintenance and repair of the steam locomotive. Part 1 shows at the atmosphere on an engine shed from roundhouse to straight sheds. Smoke and steam abound on all five regions. On arrival on shed, the fires were cleaned or dropped providing many volcanic scenes. Then to the ash pits to be cleaned. Smokebox emptying and tube cleaning were the dirtiest jobs on the railway. Replenishing the engines with coal and water took many forms and with sometimes hilarious results. Speed of turnaround was sometimes important with some breaking of the rules.